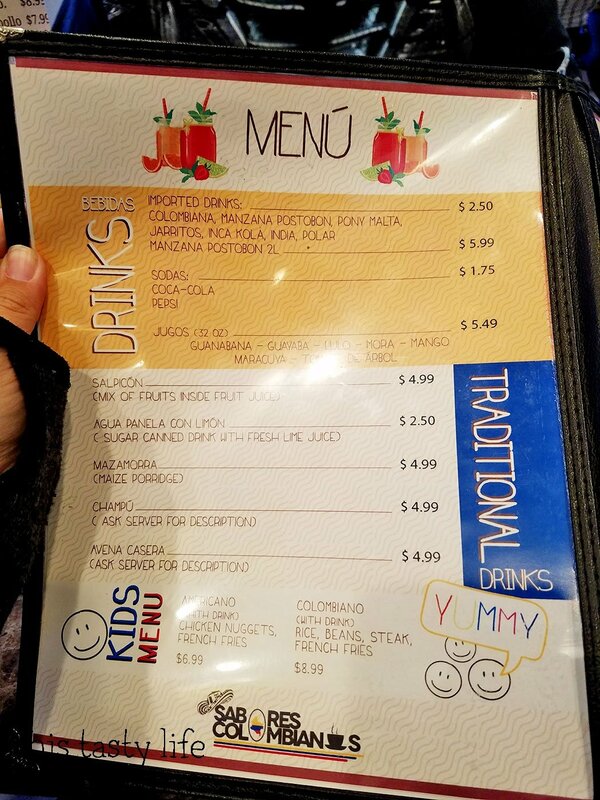 Last month Jake, Laura, and I had a little dinner outing at a new-to-us place in City Heights called Sabores Colombianos. They had arepas on the menu and I wanted to try them out and luckily everyone agreed with my plan. 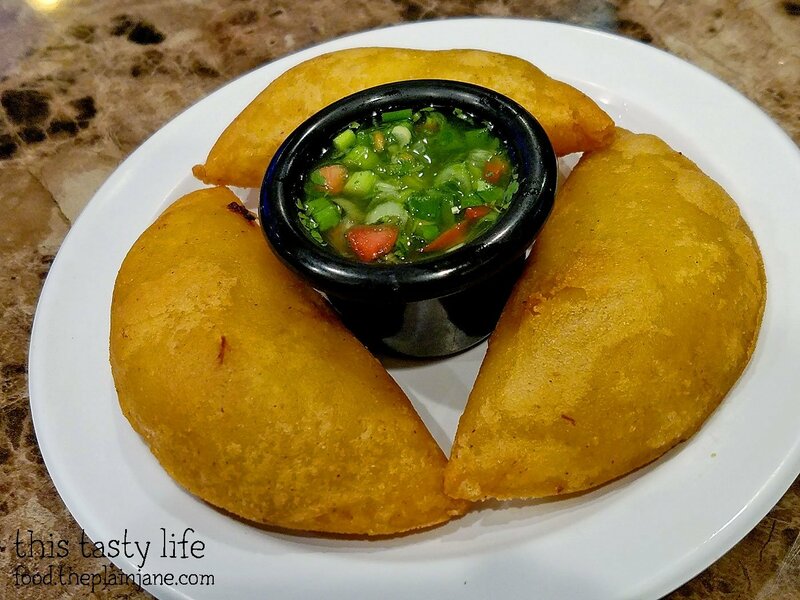 Sabores Colombianos is on University Avenue, not too far from the 15. It is street parking only but we were able to park right next to the restaurant. The day we went the restaurant got a bit packed with people watching a soccer game. They would get quite excited when someone almost scored a goal. As someone who doesn’t follow soccer, it was quite interesting to watch. 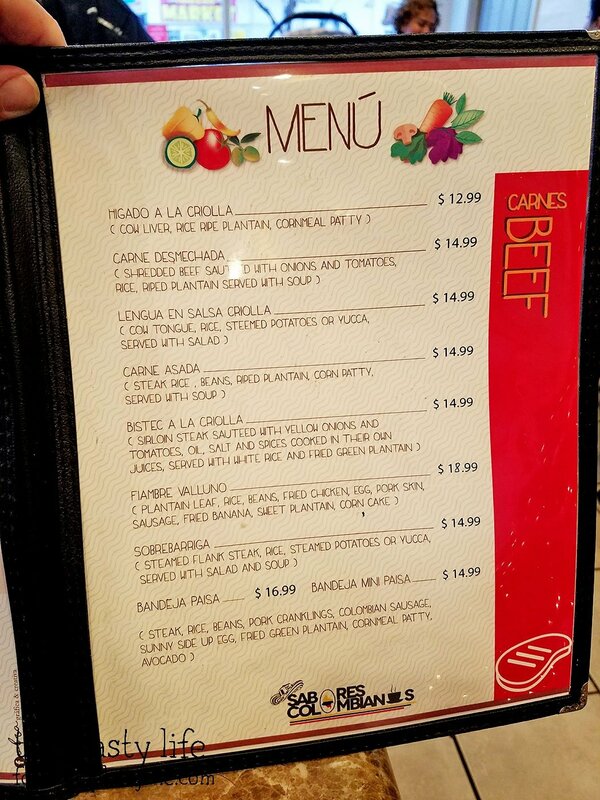 Here’s the menu at Sabores Colombianos. 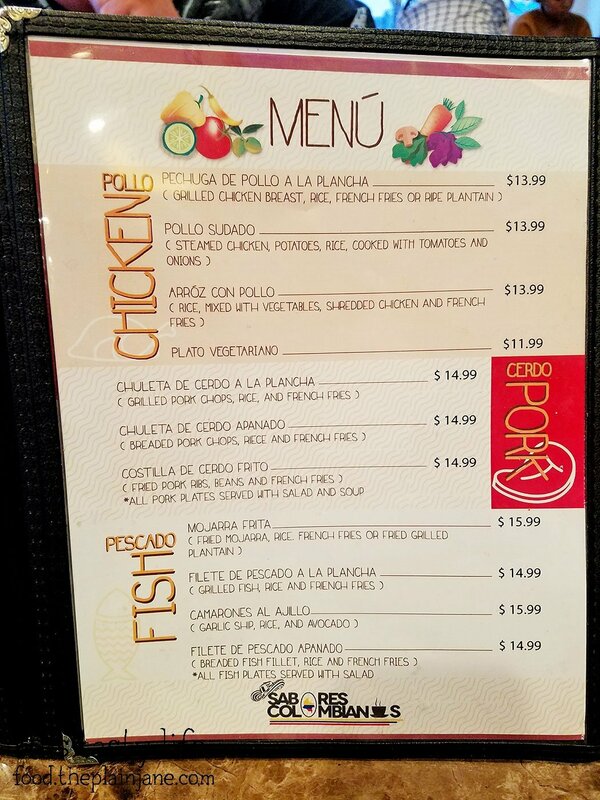 Lots of options at Sabores Colombianos! We started off with the Empanadas with shredded beef [$1.99 each]. We figured these were small and got one for each of us. It came with a little jar of tasty homemade sauce. The sauce was very flavorful and had a kick of spice to it. I only used a little of it so it wouldn’t be too spicy for me. These were freshly made and hot out of the fryer. The empanada shell was crispy and warm but still had a tender bite to it. The filling was stellar! A wonderful flavorful mix of beef, spices, and veggies (maybe potato? not sure). I had ordered some soup and I assumed this was the soup I ordered… but later found out this is the soup that comes when you order an entree! I have no idea what this soup is called. Not really sure what that is in the middle but it had a soft, chewy texture to it. Maybe yucca? Or plantain? It tasted potato-ish but not really like a potato. The broth was so flavorful and we all really enjoyed this. Later another soup was brought to our table towards the end of our meal and I had no idea it was the soup I had ordered – oops! Instead we got this soup to go and I enjoyed it for lunch. 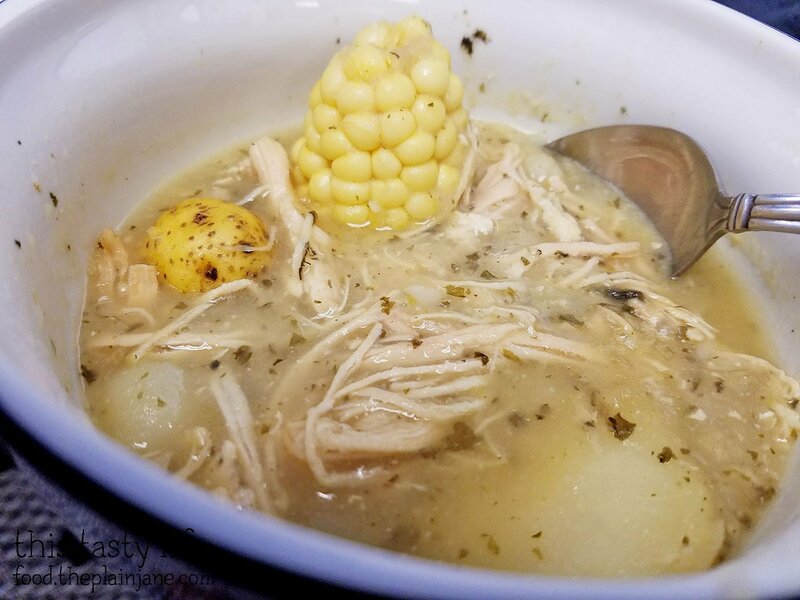 This soup was called Ajiaco [$9.99 half portion / $14.99 full] and it is soup made with chicken, three kinds of potatoes and guascas. This was so so good and I was glad we got it to go and I had it for lunch. The corn on the cob was kind of hard to eat though, so I ended up using my spoon to pull the kernels off. It had a nice garlicky kind of flavor to it and the brother was outstanding. I’d love to eat this again! More shared appetizers for us! 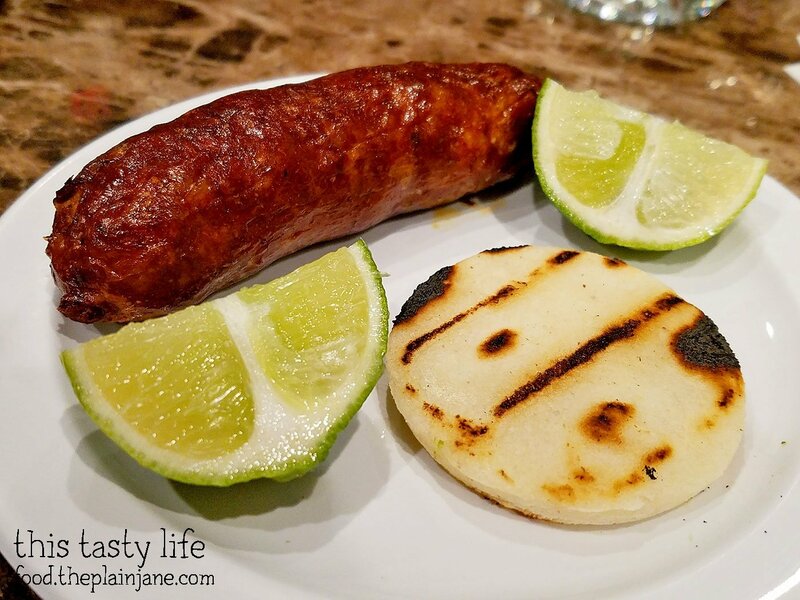 This time we got the Chorizo con Arepa [$3.99]. The arepa was kind of disappointing. It was bland and meh but the chorizo made up for it by being deliciously awesome. It was tender and juicy and thankfully not too spicy for me. Yum yum! 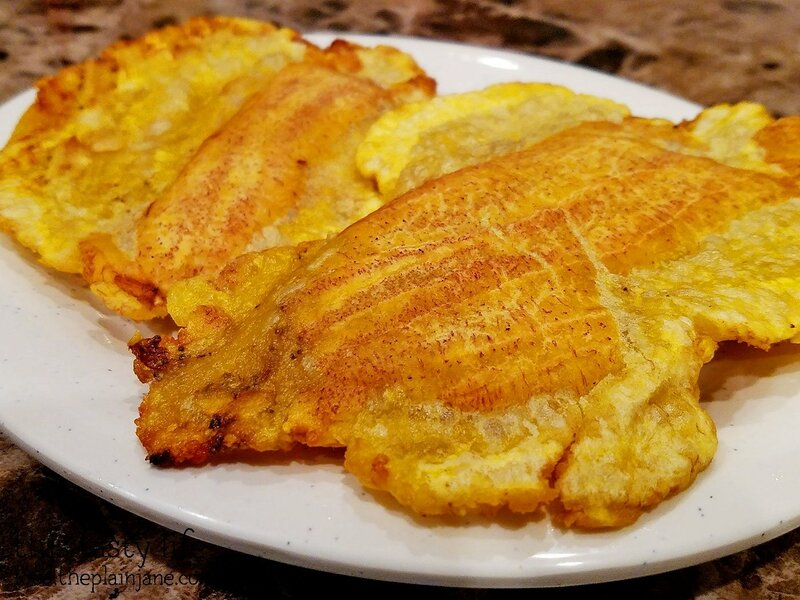 We also shared an order of Patacon [$3.50] which was a deep fried squashed plantain. It was kind of on the cool side and didn’t have a ton of flavor. Maybe it needed some seasoning? Or maybe we prefer it in smaller pieces? The three of us didn’t enjoy this one. 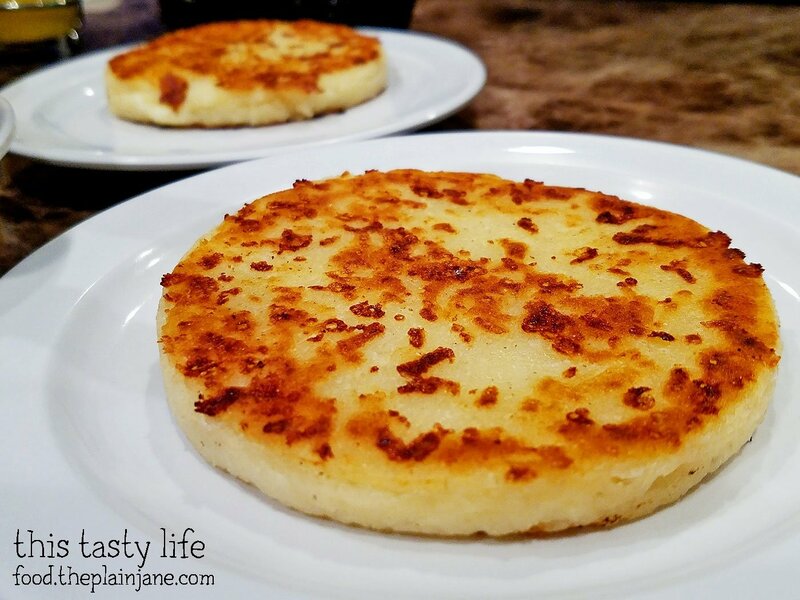 Arepas! They had a few different kind of arepas but we decided to share the Arepa con Queso [$2.75] and got two of them to share. We probably only needed one since we had plenty of food that night! I wish the cheese had been melted a bit more inside this one but I still enjoyed the flavor of it. I’d probably order other things though instead of arepas (like more empanadas, mmm mmm). Since we got so many appetizers to share, we figured we only needed one entree to share. That was a good call since this dish was HUGE. 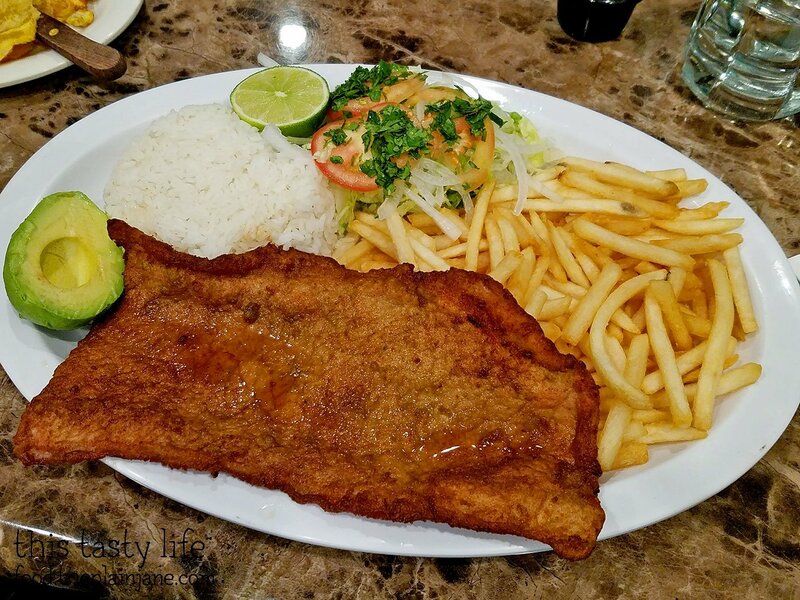 This is Chuleta de Cerdo Apanado [$14.99] or breaded pork chop with rice and french fries. The breaded pork chop was quite thin and crispy but remained nice and juicy on the inside. I really liked it! Laura and I got to share the avocado, too, without splitting it with avocado-disliker Jake. There’s even MORE french fries tucked under the pork chop that you can’t see so this was plenty of food for sharing. 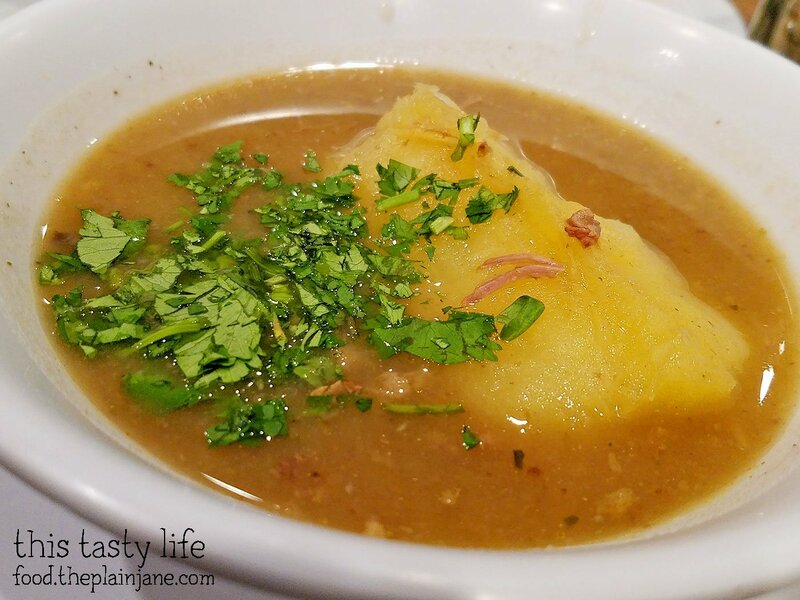 We were all quite impressed with how flavorful and tasty all of the food was here at Sabores Colombianos. Everything has a “homemade” feel and taste to it which we all really enjoyed. 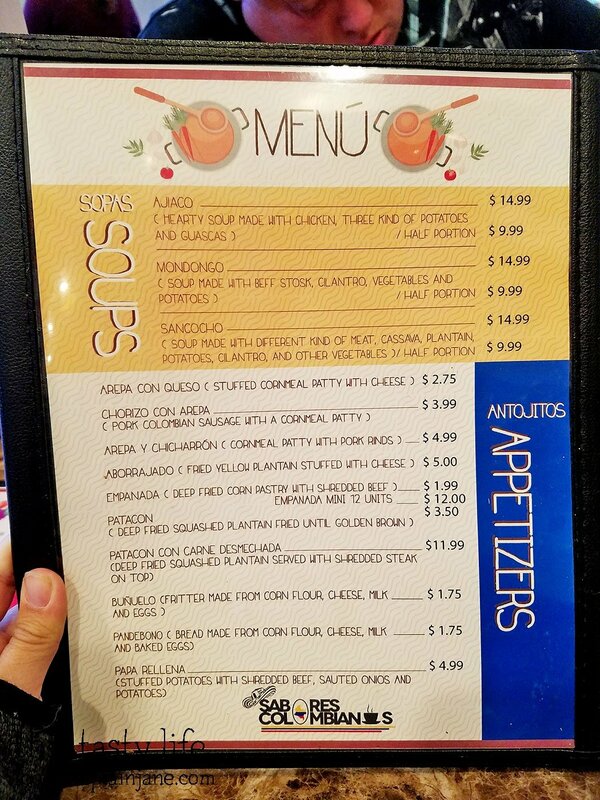 I’d love to bring more people here to check it out and try more items on their extensive menu! 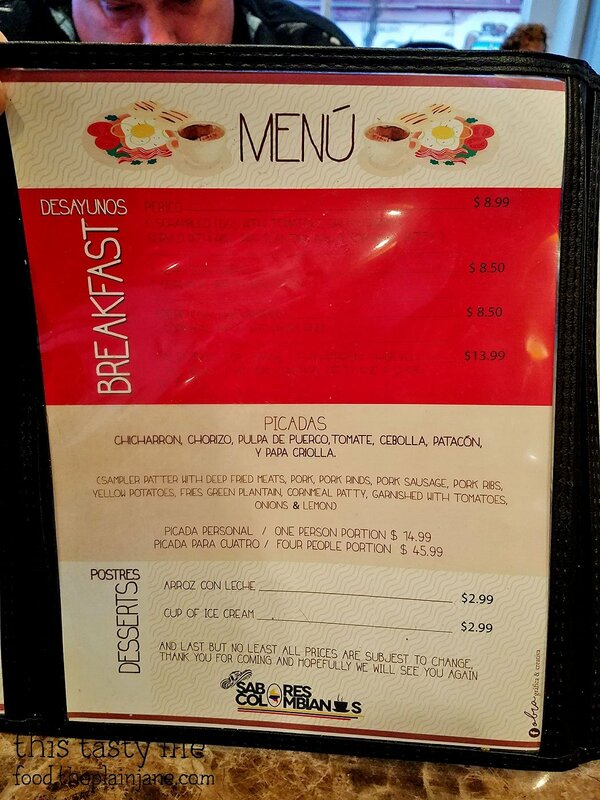 Mary – You should definitely have the lengua en salsa here. I think it’s the best dish on the menu. 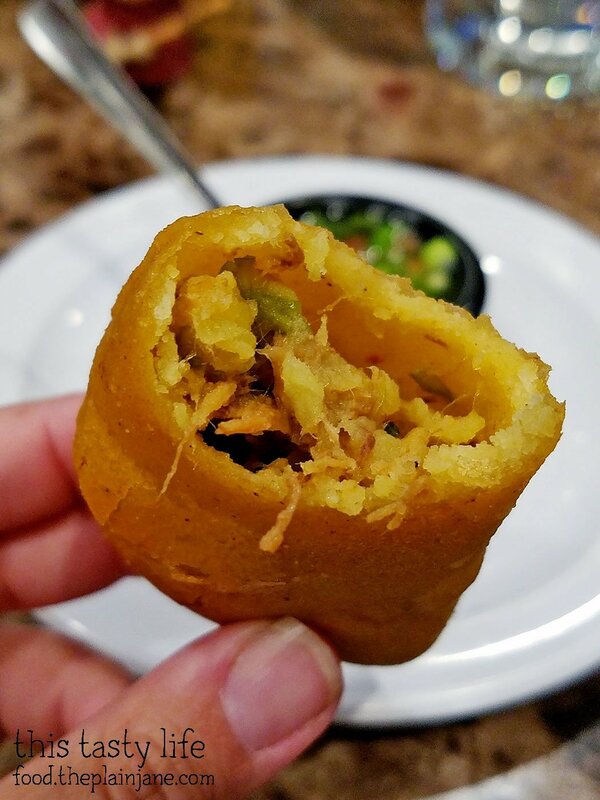 Also, check out Antojitos Colombianos – I believe there’s some connection. But I thought the food there was a tad better. Thanks for the tips and suggestions, Kirk! I appreciate it! Count me in if you ever want to do a return visit!